Welcome to Day #8 of Chocolate and Cacao Nibs Theme Week. 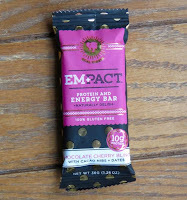 Today's Chocolate Cherry Bling with cacao nibs and dates bar was distributed by Empact Bars LLC (Boulder, CO). 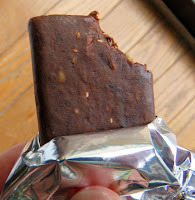 This protein* and energy bar was a small, cheery package of dense goodness. The "Goal Digger" tagline, on the shiny gold polka-dotted black and pink packaging was a play on gold digger. I'll take it either way. 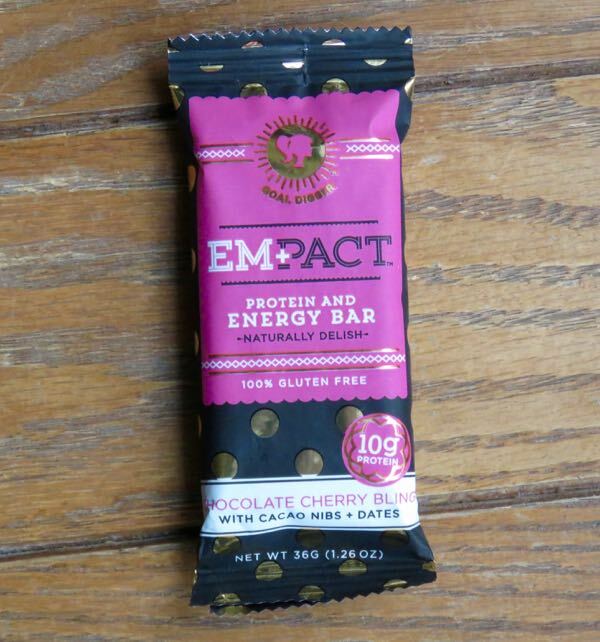 The bar had well-balanced dried fruit (dates, unsweetened tart cherries), chocolate brownie (cocoa powder, cocoa nibs) and protein (whey protein, golden flaxseeds, white chia seeds) flavor and textures, compressed into a classy dark protein bar. *This bar contained 10 grams of protein.